"Simmons was one of a handful of artists who kept traditional Chicago blues alive through the disco infested 70's. You won't hear him strike any false notes, musically or emotionally. 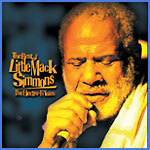 LITTLE MACK SIMMONS: The Electro-Fi Years, with it's varied musical flavors, should please those who love no frills blues and roots music. It's a great place to start for anyone who wants a sampler of Simmons' legacy". Blues Revue also reports our Little Mack disc is one of the Top Ten most often listened to recordings in their office. An obituary of his close friend Little Mack Simmons, written by Electro-Fi's president Andrew Galloway, appears in the March/April 2001 issue of Living Blues magazine.